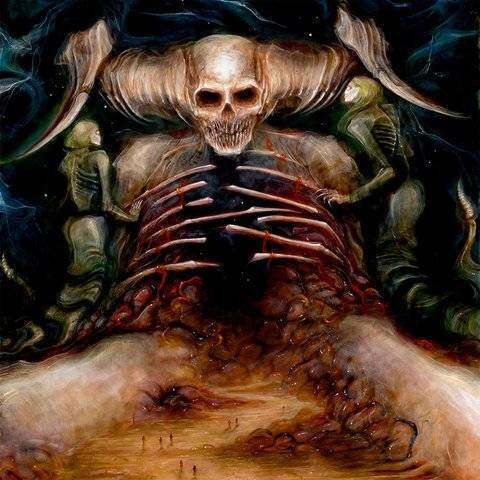 Horrendous are a death metal band that seemingly came from nowhere and have brought forth a strong resurgence of death metal new and old from the northeast. Their debut The Chills was a fine slab of death metal that hinted at things to come and then Ecdysis changed things up and unleashed the fury and power of death metal riffing that could easily be found somewhere within 1991. Luckily merely a year later they have blessed us with Anareta, which changes things once more and shows the band evolving on the songwriting front as well. Well how does it stack up against the others? Anareta on first listen is excellently paced and while intro "The Nihilist" is laid out differently than Ecdysis' "The Stranger", it still helps to set this somewhat different tone. With all of this talk of being different I should clarify. If Ecdysis was similar to Human, I certainly think Anareta is more ambitious with more of a Symbolic feel. The more long form pieces and melodic guitar leads showcased on "Stillborn Gods" and instrumental stunner "Siderea" are perfect examples of this; hell "Ozymandias" could very well be its "Crystal Mountain." This could be the best guitar work we've seen from Damian Herring and Matt Knox yet. One element that may get overlooked at times are the insane drum chops of Jamie Knox. His fills on "The Nihilist" are sublime and fit in well with the odd riff tempos. Leading into "The Solipsist (Mirrors Gaze)" you might feel a slight taste of Cynic's Focus but that quickly subsides with a bludgeoning of mid-paced riffs. With ample balance and time to recover from absolutely stunning guitar work; Anareta could top Ecdysis in terms of Horrendous albums. This is easily one of the most accessible and necessary death metal albums of this year and one that surely will find its way onto tons of year end lists. Death metal fans, you need Anareta in your life and now!